This is with reference to Charulatha Mani’s fortnightly article ‘A Raga’s Journey’ that has raga Charukesi in today’s issue of Metroplus supplement. 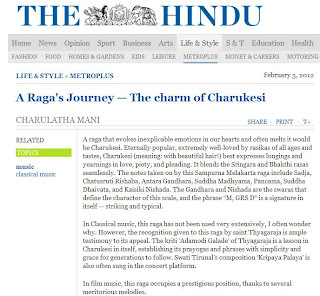 Charulatha’s opening lines in this article for raga Charukesi is indeed very impressive- “a raga that evokes inexplicable emotions in our hearts and often melts “ - a beautiful description about Charukesi. But that ends there itself and most of the film songs she knows and has taken up for this article do not qualify for this description. Charulatha seems to enjoy only the mediocre recent film songs composed by Deva and A R Rahman. Happy atleast this time Charulatha has mentioned songs of Kunnakkudi Vaidyanathan and V Kumar. 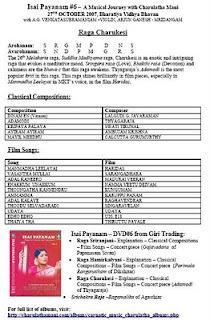 Please continue Isai payanam…feel the best way for youngsters to understand and listen to good music. You rendition and explanation of Mohanam and Chaurkesi was just too good. Madam I’m a great fan of you after from naan avan Illai to till velayudham ur voice very bold and good now only know you ‘r a great carnatic singer…..